History Revealed: Lets Go Fishing! 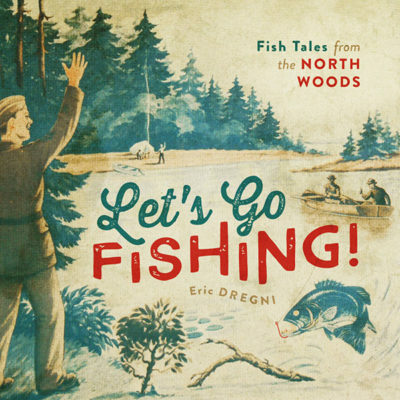 Eric Dregni, who has entertained countless readers with enlightening tales of Midwest marvels, will show his considerable skills as a raconteur and cultural historian of the fun and the facts of fishing in the Great Lakes region. Eric will present some of the highlights from his book, Let’s Go Fishing! : Fish Tales From the North Woods. Eric will present historical postcards, advertisements, prints, and tourist snapshots, in an always fascinating, occasionally hilarious, and informative compendium of fishing lore. A celebration of the sport in the land of 10,000 lakes, lavishly illustrated, Let’s Go Fishing! will be available for purchase and signing. Eric Dregni is associate professor of English and journalism at Concordia University in St. Paul. He is the author of more than a dozen books including Midwest Marvels, In Cod We Trust, By the Waters of Minnetonka, and Never Trust a Thin Cook, all published by University of Minnesota Press. Registration is needed to attend presentations. Space is limited, first-come, first served. Or call 651-222-0701 or email membership@rchs.com. It’s RCHS Day at Waldmann Brewery & Wurstery! On the second Thursday of each month, 10% of all sales to RCHS members and their guests will be donated to the Ramsey County Historical Society! RCHS members and supporters are encouraged to come and enjoy a lunch/dinner/drink at Waldmann throughout the day, or time your dinner so that you can stay for the presentation immediately after. So come on in and raise a toast to history and support RCHS! Mention that you are a member, supporter or friend of RCHS to your server, and they will make sure that your tab is counted toward Waldmann’s support. For 2019 History Revealed programs, see https://www.rchs.com/news/history-revealed-2019/ New programs are being added.